"Tanks shall be constructed of high Density Polyethylene (HDPE) plastics conforming to ASTM-D-1248 and be free-Standing and Self-Supporting. Color to be Black (industry standard) or White in special production. Tank shall be provided with a 3/4" (19mm) thick bolted and gasketted polyethylene cover. Nuts and bolts shall be stainless steel. Gaskets are neoprene. Tank shall be provided with 2" (50mm) or 3" (75mm) female threaded inlets, outlets and vent connections. Tanks to be provided with high purity Limestone (calcium carbonate) chips, 1" to 3" in size. The neutralization chip medium can be lump limestone or marble chips, 1" - 3" diameter, with a high calcium carbonate content in excess of 90%. Water added to the tank helps facilitate dilution. In operation, the acids percolate up through the limestone and are chemically neutralized and dilution of chemicals discharged through a system. Professional assistance should be employed in analyzing the effluent, recommending appropriate equipment and necessary maintenance services." Rotationally molded polyethylene neutralization tanks are designed to receive, dilute and neutralize corrosive and harmful chemical wastes before allowing such materials to be discharged into the public sewers or to the environment. and on large capacity tanks 150 gallons (560 liters) or gretaer, with welded cover styles with manhole / manway access door, if required, at extra cost. Neutralization of corrosive, toxic and flammable wastes is necessary to protect the environment and piping systems, even when quantities and concentrations are small. Such wastes can cause physical damage to a building's piping or outside sewer systems and, if effluent is being discharged to the environment (such as rivers and lakes), severe damage can result to wildlife and water sources. 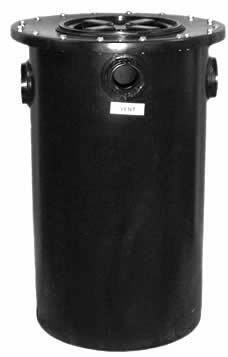 All bolted neutralization tanks are furnished with male, female or plain end fittings. Tanks may be ordered with variations to inlet / outlet locations. Typical location would be 180 degree opposite side of tank. diameter size range and have calcium carbonate content in excess of 90%.